Doesn't matter, the Yanks will leave the Sox in the dust! Your jokes, though well-intended, need some work. But at least you’re trying. Great job! Pretty lucky win for the Sox, with Betts hit sliding under the glove by a couple of inches and the Mariner home run missing by a few inches mid-game. But the M's beat up Eovaldi pretty good. The M's big mistake was letting go of Diaz who would have shut the Sox down in quick order. I can’t disagree with this at all. That would have been the end. That game went about the way I thought it would. Nice W for the Ms. I have to say, I didn’t expect that I’d like your third baseman so much. Looking forward to attending today’s game with the fam. Here’s to Porcello getting the starting pitching right. Yes, I sure missed Diaz the last couple games. But giving up Diaz was the price for getting rid of Cano, and I can't imagine a serious rebuilding effort while carrying the dead weight of Cano. The M's had already wasted too many years selling off their prospects and decimating their farm system in order to keep established players. Even so, I sure would have liked to see Diaz scorching through saves in those last two games. Yes, I sure missed Diaz the last couple games. Great series. Didn’t work out to well for my team but they were exciting games that could have gone either way in 3 of 4 contests. I hope this isn’t just Mariners positivity month (what I call March/April) and I sign of things to come. It sure would be nice to see the two square off in the postseason. On the Red Sox side of things I think they really miss the catcher, Sandy Leone, who cleared waivers after being released, and is playing in AAA Pawtucket (Sox). The middle relievers for the Sox were surprisingly good and the starters were surprisingly bad. On paper it should be the other way around. His calming presence, or lack thereof, has something to do with the starting pitching in my opinion. First, I make no claim to have written a dissertation on the gentility of the model Sox fan. I had thought that some comments that might be taken as unfavorable concerning the visiting team were made from time to time at Fenway. 1) Mariners fans spend all game not cheering; it’s like a library unless there’s a hydroplane race on the scoreboard. 2) Opposing fans start a cheer for the visiting team. Mariners fans then become passive aggressive and just do stuff that lands on me as silly. Just cheer for your team willingly and upfront and you’ll get a lot more respect from the Boston fan base. We’d be less inclined to try and make it seem like a Boston home game any chance we get. Regarding Fenway, fans there are generally nice. They’ll make you feel at home. It will involve some very direct ribbing to your face but with a laugh and a smile and you probably won’t find it very aggressive. Except for when the Yankees are in town there generally aren’t large groups or fans from opposing teams so there aren’t major conflicts. But we do love to hate our Yankee friends and family. I think you’ll find we also respect them. Without their passion and hatred of the Sox, the greatest rivalry in baseball, possibly in sports, doesn’t exist. Congrats again on the W. The M’s bats looked great. It’ll be interesting for both teams to see how the Sox play down in Oakland. Stop telling us what to do. We'll do what we want to do. You're trying to change the attitude of Seattle sports fans. It's not going to work. Go back to the Red Sox thread. He can't go back to the Red Sox thread, it's nothing but an echo chamber of him screaming arrogantly at the walls. He figues dumping repetitive garbage here is him living his best life. I’m not sure what that means because I only speak English but I love you Sluggo. Mariners are 8-2. 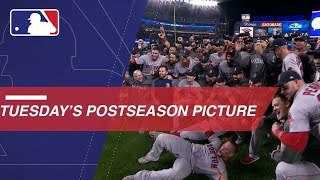 Red Sox are 2-8. Who would have thunk it? Every game on my end has been incredibly painful to watch. The Sox have shown moments of amazing brilliance followed by amazing collapse. I think they need to get back home, get their rings, and have Pedroia rejoin them. Congrats to your M's. Lets' see what later in the season brings.